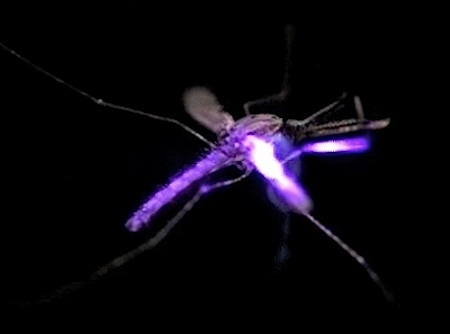 The first public demonstration of laser-based anti-mosquito warfare was given at the annual TED conference. I had written about the first use of this device last March (see Laser Kills Mosquitoes Like Brin's Bee Zapper). Nathan Myhrvold's company, Intellectual Ventures has assembled technology used in printers, digital cameras and projectors to shoot down mosquitoes by the hundreds in mid-flight. After hundreds of mosquitoes (which were kept in the hotel bathroom until showtime) were released into a glass tank, a laser tracked their movements and slowly shot them down, leaving their carcasses scattered on the bottom of the tank. While the demonstration was slowed down for public viewing, Mr. Myhrvold said that normally the lasers could shoot down anywhere between 50 to 100 mosquitoes per second. The laser detection is so precise that it can specify the species, and even the gender, of the mosquito being targeted. “The women are bigger. They beat at a lower frequencies,” Mr. Myhrvold said. Myhrvold credits a 2008 brainstorming session on killing malaria-bearing mosquitoes with the idea for a 'Star Wars-style' anti mosquito weapon. Note that Brin's bee-zapper also differentiates between insects based on their wing-beats. Via NY Times; thanks to Winchell Chung for the tip on this story.